We sandblast and paint our own products. We have a state-of-the-art 1500 sq. ft. engineer designed paint booth. Also, we have a newly constructed stand alone 1500 sq. ft. sandblasting building. Typically products are sandblasted with environmentally friendly grit to a near white finish, and proceed into our newly constructed paint booth where an epoxy primer and polyurethane topcoat are applied. Sandblasting & painting of other products can be provided as well. 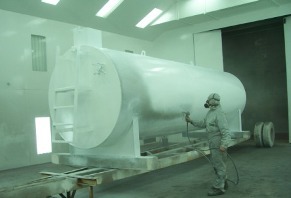 Please call us for a quote for any of your sandblasting & painting needs.